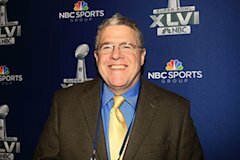 Newspaper Rock: Peter King website bans "Redskins"
Peter King is the racist, not Steve? Because Peter King or his website is banning the word "Redskins," you think he's a racist? How do you figure that? Rob: I think he is referreing to some racism by the Congressman Peter King. A quick search didn't find any, but it might exist. It is confusing enough with two Peter Kings and a couple of Steve(n) Kings.